Pastor Rene’ was born in Dallas and has lived primarily in the Dallas-Fort Worth area all of his life. Following the steps of his grandfather, who was a United Methodist minister, Lawson entered the ministry while in college. Pastor Rene’ holds a bachelor’s degree from Texas Wesleyan College in Fort Worth, a master’s degree from Southern Methodist University in Dallas, and a doctor of ministry degree from Houston Graduate School of Theology in Houston. He also holds a diploma in Joint Professional Military Education from the Naval War College in Newport, Rhode Island. Pastor Rene’ is also a Navy Reserve chaplain. His work has led him to serve Sailors and Marines across the globe, including a combat tour to Al Anbar Province in Iraq. His current assignment is with the Navy Region Southwest Operational Center in San Diego, CA. 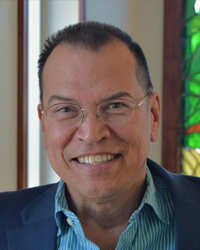 Pastor Rene’ has served in a variety of ministry settings throughout his career and is excited to be serving St. Philip’s United Methodist Church.